WASHINGTON, DC, April 18, 2010 (ENS) – Federal regulators proposed a rule Friday that would cut mercury emissions from gold ore processing and production facilities, the sixth largest source of mercury air emissions in the country. The largest source of atmospheric mercury is the burning of coal and other fossil fuels. The U.S. Environmental Protection Agency is proposing to add gold mine ore processing and production to the list of source categories subject to regulation under the hazardous air pollutant section of the Clean Air Act due to their mercury emissions. EPA is also proposing the first national mercury air emission standards for this source category, requiring Maximum Achievable Control Technology. The standards would be based on the emissions level of the best performing facilities that are well controlled for mercury. The EPA says that if approved, the new standards would reduce annual mercury emissions from gold processing and production to about 1,390 pounds a year – a 73 percent reduction from 2007 levels. There are about 20 facilities in the United States that extract gold from ore that would be subject to the proposed rule. 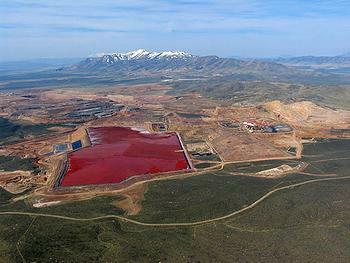 The majority and the largest of these facilities are located in Nevada, where the ore containing gold also contains mercury. The other facilities currently operating are in Alaska, California, Colorado, Montana, and Washington. In March 2006, Nevada created the nation’s first state mercury air emission control program at precious metal mining facilities. The state requires mines to install and operate Maximum Achievable Control Technology for atmospheric emissions of mercury. McCarthy said the action EPA proposed Friday would build on the success of Nevada’s program for controlling mercury emissions. Once mercury is released into the air through smokestacks and processing emissions, it can travel long distances, settle on soil and wash into lakes and rivers. Mercury in lakes and rivers is converted into methyl mercury by bacteria. Fish ingest methyl mercury by swimming or feeding in contaminated water and the chemical accumulates in fish tissue and is concentrated as it is carried up the food chain to larger fish, animals and humans. The health effects in humans who ingest too much fish containing mercury includes neurological damage and danger to pregnant women and their fetuses, as well as young children. Once ingested, mercury remains in the body, damaging the nervous system, and exposure is especially dangerous for children. Exposure to mercury can cause neurological and developmental problems such as attention and language deficits, impaired memory and impaired vision and motor function. It can cause mental instability, dizziness, numbness in the limbs and personality changes such as nervousness, increased excitability or insomnia. When the EPA sets the mercury emission rules, they are could become the standard for the gold mining industry the world over. EPA will take public comment on the proposed rule for 30 days after it is published in the Federal Register.